Unions have called off a 72-hour Tube strike planned for next week. Members of the Rail Maritime and Transport (RMT) union and the Transport Salaried Staffs Association were due to walk out from 1830 BST on Sunday. Talks have been ongoing since they voted for industrial action in protest at ticket office closures and the use of agency employees. 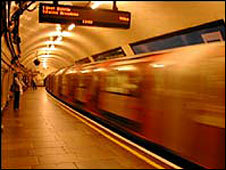 London Underground (LU) had said the issue had nothing to do with safety and no jobs were at risk. More than 7,000 station staff, signallers and drivers were due to take part in the action. The unions had concerns about staff working alone and LU's plans to introduce "mobile supervisors" at stations. RMT general secretary Bob Crow said: "We now have a guarantee that there will be proper supervision and that the current use of agency and security staff during traffic hours will be brought to an end." "Our members have blocked changes that would have undermined the Tube's excellent safety standards." RMT said the talks also ended the dispute about station staff on the Bakerloo Line who were required to empty trains of passengers while working alone.